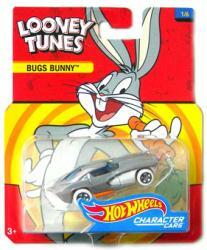 This is a 1:64 Bugs Bunny die-cast vehicle from the Looney Tunes series of the Hot Wheels Character Cars line. This die-cast vehicle measures approximately 3" in length and was produced by Mattel in 2016. This die-cast vehicle remains new and sealed in its original NEAR MINT packaging.